The Control Pad by Sega OziSoft is a name given to two controllers for the Sega Saturn, released exclusively in Australia in 1995 and 1996. Two variants of the Control Pad exist. The first variant was released in 1995 and is a re-brand of the Saturn-8. It is a standard replacement controller with no additional functionality. The second variant was released in 1996 and is a re-brand of the Turbo Sat. This variant has turbo switches on the back of the unit. 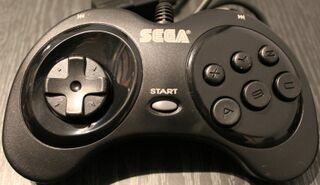 Although several turbo controllers received official branding for the Sega Mega Drive (namely the Sega MegaFire), this is the only "official" Saturn control pad to offer this function (the Virtua Stick offers these functions in arcade stick form).